One German-Jewish family’s experiences during the Shoah reveal broader trends in this cautionary account by the author of Where Ghosts Walked (1997). Large (History/Montana State Univ.) writes modestly at the outset that an account such as this, focusing on only a handful of people, cannot provide definitive answers to such big-picture matters as the democratic powers’ failure to rescue Europe’s Jews by allowing unimpeded immigration. Yet the Schohl family’s experience is highly instructive: though moneyed and well-educated, they were turned away from every portal of escape, barred from entering England, the US, Brazil, even Chile by bureaucratic indifference at best, barely covert anti-Semitism at worst. The large J stamped on their German passports—an invention, Large writes, not of the Nazi regime but of the Swiss, “to facilitate the process of excluding” Jewish refugees—was shibboleth enough to bar the Schohls from fleeing, though family members and friends in the US and England did what they could to get them out. 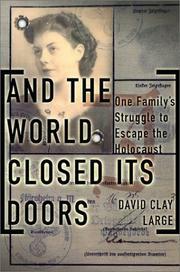 More than describe the Schohls’ misfortune on that count, Large details the daily life of Jews within the Third Reich. He writes, for example, that Max Schohl was well-regarded in his native village of Flörsheim, both for his heroism during WWI and for such acts as paying his workers in dollars during the collapse of the Weimar economy and providing needy families with food. Such acts of kindness did not keep his lifelong best friend from refusing to step in when Max was sent to Buchenwald in 1938. (The same friend asked the Schohls to testify to his good character at his postwar trial, a request they denied.) And the people of Flörsheim simply pretended not to notice when the Schohls disappeared. Drawing on a wealth of family documents that supplement the official histories, Large gives a compelling portrait of a family, a place, and a nightmarish time. A welcome addition to Holocaust literature.